If you are considering getting engaged, you are probably wondering how much to spend on an engagement ring. Of course, the standard “two-month’s salary” rule probably comes to mind. But is it realistic or even feasible in this day and age? Engagement ring budgeting is something you should consider as soon as you have made the decision to do a proposal. Not all of us have the budget of a celebrity, so we need to stay grounded and think realistically. Here is a helpful guide on how to set, and stick to, a strict budget for engagement rings. If your financial situation is stable, then the three months’ salary rule is totally acceptable. However, if you are on a tight budget or have a great deal of financial debt, that you should opt for the two months salary or even one months salary rule. This is perhaps the most realistic of the three “standard” rules for engagement ring budgets. One month’s salary is a realistic amount, depending on your income. If this will leave you strapped, then you should spend an amount with which you feel comfortable. However, in our opinion, one month’s salary is the most you should spend on an engagement ring. Remember you have other things to take into consideration, such a building a life together, purchasing your first home, starting a family and so forth. Don’t feel compelled to follow the typical rules for engagement ring costs. The crux of the matter is that it is entirely up to you. Only you know how much you can realistically afford. Honestly, most women never question (or even want to know) how much their fiancé has spent on their engagement ring. As such, a lot of women today are more practical and down to earth, and do not want their fiancé to spend an extravagant amount on her ring. Even if you have saved enough for a down payment for the ring, or are gong to finance the purchase, you need to spend an amount with which you feel 100% comfortable. If you are the least bit hesitant or worried about not being able to make payments, then perhaps you should rethink and reconfigure your engagement ring budget. You need to take your current situation into mind such as your monthly bills including rent, car and insurance payments, medical insurance and bills, student loans, unites and the like. You need to make sure that you are still going to be able to make your required monthly payments and you don’t want to stretch yourself thin and end up going into debt or damaging your credit score. Are you willing to spend your entire savings on an engagement ring? Or do you want to have nest egg in the event of an emergency? Do you need to save for a down payment for a new home? Future educational plans? Starting a family? How quickly will you be able to replenish your savings? These are all things you need to think about before spending your entire savings on a ring. Does your job have room for growth and advancement? Are you getting a bonus or raise in the near or immediate future? If so, you could factor this into your budget, but don’t go overboard, stay grounded. Hopefully, at this point in your relationship, you have some idea as to your partner’s expectations and desires for her engagement ring. Does she have expensive tastes? Or is does she prefer something simple yet elegant? Not every woman needs a flashy, gaudy ring. Make sure you know her tastes and style before you spend too much (or not enough in some cases) on her ring. She might be one of those who prefer a ruby over a diamond or yellow gold over platinum, which would ultimately save you a lot of money. 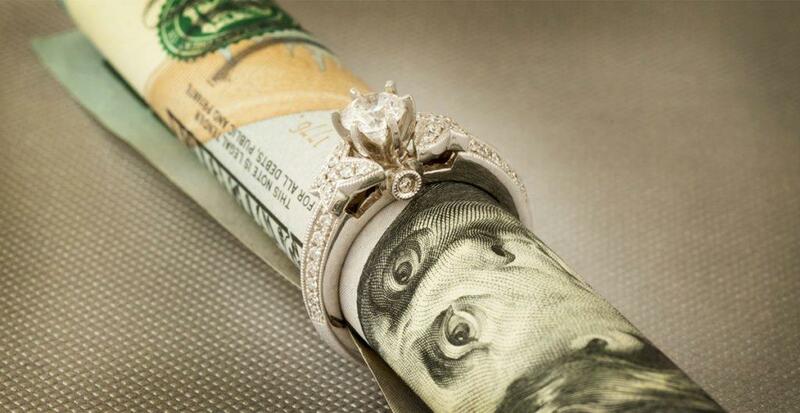 In fact, most women would rather have money put away for a future than an overly priced engagement ring. See if you can get some general information from her before you start ring shopping. Is your girlfriend a sucker for romantic and sentimental gestures? Perhaps your family (or hers) has an heirloom rig that has been in the family for generations that they are willing to give you, or even sell for a reasonable rate. A lot of women would prefer a family ring over a store bought ring that has no personal meaning or history. Keep all of this in mind when you are deciding how much to spend on an engagement ring and you should be fine! We do not advise to pay for the ring with a credit card, as you will have to pay high interest rates. And do not, get yourself into debt or a situation where you could hurt yourself financially. Good luck with your engagement ring shopping and congratulations!